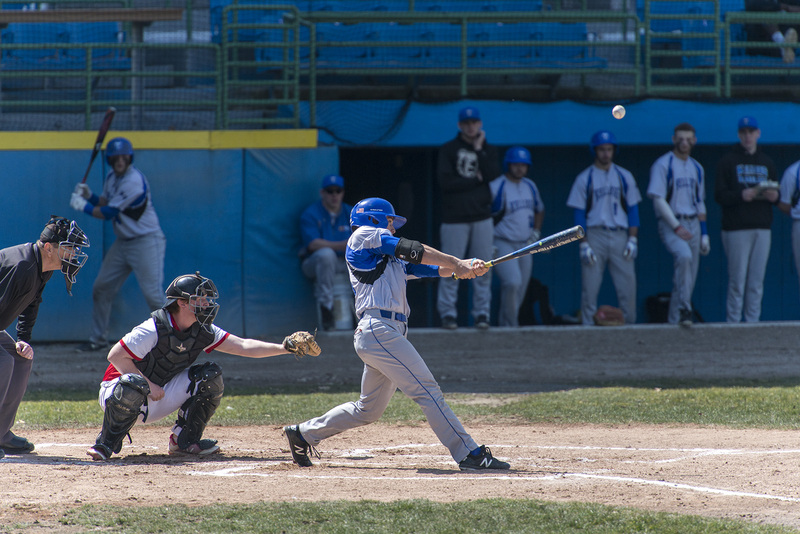 The Kellogg Community College baseball team is on a 13-game winning streak after a four-game sweep of conference opponent Lake Michigan College this week in Benton Harbor and Battle Creek. Below are the results of the Bruins’ series against LMC. To sign up to receive KCC baseball results by email, visit www.kellogg.edu/baseball and fill out the “Get KCC Athletics Results by Email” form on the left side (desktop) or bottom (mobile) of the page. You can also get real-time updates from the team by following the Bruins on Twitter at https://twitter.com/BaseballKellogg. KCC baseball defeated LMC 9-0 in the first game of an afternoon doubleheader away in Benton Harbor on Tuesday. On offense for the Bruins, sophomore infielder Riley Creamer (Lansing/Lansing Catholic Central High School) hit 2-3 at the plate, including a double and an RBI. Sophomore catcher Korey Knowles (Monroe/Ida High School) also hit 2-3, including a double and an RBI. Blake had a dominating performance, carrying a no-hitter into the sixth,” Head Baseball Coach Eric Laskovy said. In game two Tuesday, KCC defeated LMC 15-0. The Bruins were a force on offense. Knowles hit 2-3 at the plate, including two home runs and five RBIs. Freshman outfielder Spenser Nelson (South Bend/John Adams High School) also hit 2-3, including a home run and two RBIs. At the mound, right-handed freshman Zack Zarbowski (Portage/Portage Central High School) pitched 1.2 innings, striking out four. The Bruins returned to Battle Creek for round two with LMC on Thursday, winning the first game of the afternoon doubleheader 6-2. On offense, Knowles hit 3-4, with 2 RBIs. At the mound for the Bruins, right-handed freshman Mark Scannell (Grand Rapids/Forest Hills Central High School) got the win in five innings pitched, striking out seven and allowing five hits and one earned run. Right-handed freshman Ethan Eldridge (Battle Creek/Lakeview High School) had the save, pitching two innings, allowing two hits and striking out one. The Bruins wrapped up the series Thursday with a 9-6 win over LMC in game two. Freshman catcher Alex Crump (Grand Rapids/Northview High School) hit 3-4 at the plate, including a double and an RBI. Sophomore outfielder Raphe Gross (Chicago/Simeon Career Academy) hit 2-3, including an RBI and a stolen base. At the mound, right-handed sophomore Bennet Norry (Grand Rapids/Kenowa Hills High School) pitched 4.2 innings, striking out four with two earned runs. The recent wins bring the Bruins’ overall record for the season so far to 22-4; their conference record stands at a perfect 8-0. The plays next at home starting at 2 p.m. this afternoon, Friday, April 13, against conference opponent Glen Oaks Community College at Bailey Park in Battle Creek, then plays Glen Oaks again starting at 1 p.m. Saturday, April 14, in Centreville. For more information about KCC’s baseball team, including a full schedule, roster and links to official team and player photos available for download by fans and the press, visit www.kellogg.edu/baseball. Head KCC Baseball Coach Eric Laskovy can be reached at 269-965-3931 ext. 2536 or laskovye@kellogg.edu.